Coffee aficionados can rejoice because it’s so easy nowadays to enjoy barista-style coffee at home. If you love coffee featuring delicious, foamy milk, you will need a milk frother to achieve this. There are countless milk frothers on the market but don’t worry, we’ve created the ultimate guide to help you through the process of selecting the perfect one. There is such a huge selection of milk frothers on the market. How in the world do you narrow it down the choices? We've listed out the most important features so you can make sure that you pick up the perfect milk frother to suit your needs. You don’t want to waste time hand cleaning your milk frother when many of them can be popped in the dishwasher. If you have a dishwasher and time and convenience are important to you, check to see if the appliance is dishwasher safe for easy cleaning. While you don’t want to overload your milk frother, you want it to have the capacity to heat up a reasonable amount of milk in one go. Always consider how much of milk the machine can froth in one go, and don’t go for too small a number. 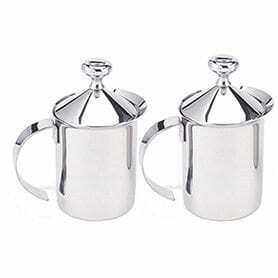 Most milk frothers can make your standard hot drinks, such as lattes, hot chocolates, and cappuccinos. Several milk frothers can even make warm milk or cold milk. 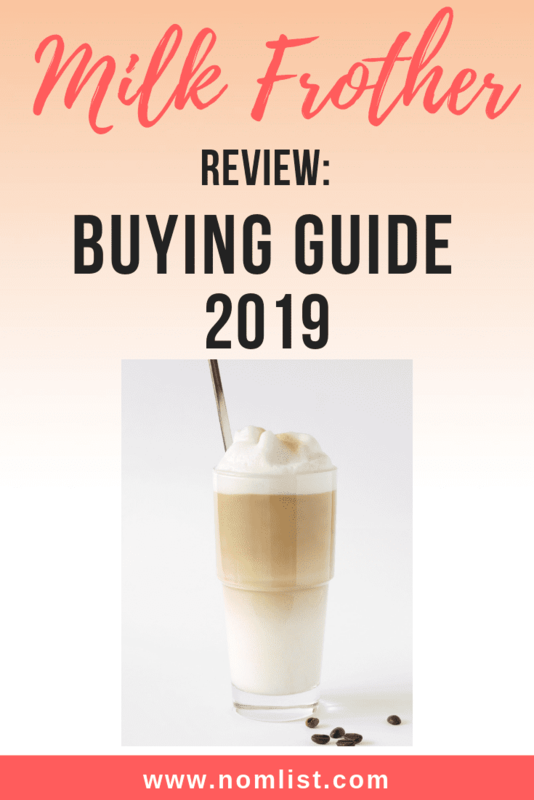 If you fancy making your own iced coffees/frappes, check to see if the appliance supports multiple temperatures before purchasing. Many machines come with multiple frothing disks that can be used to make different drinks. These allow for different froth consistencies for different drinks, thicker for cappuccinos for example. Make sure the machine is not specific to only one drink if you want to have multiple options. The milk frother options out on the market today vary quite widely in their size. It’s definitely an important consideration depending on your kitchen counter or storage space available. You may want to consider the weight of the milk frother for storage reasons, especially if you need to store the machine on a high shelf. The weight of the milk frother will also determine how portable the machine is. If you are an avid coffee consumer and love to have milky frothy foam on your coffee or hot chocolate, the electric milk frother is a necessary addition to your kitchen. If you are more of a casual coffee consumer or working with a tighter budget, a manual handheld or frother press could be an excellent alternative for you. The manual milk frother requires manpower to create that delicious frothy milk. Manual milk frothers are far less expensive than electric milk frothers but they require additional time and effort, since it’s a hand-held apparatus. To many, a few extra minutes are worth it if the coffee will be brewed to perfection. Handheld electric milk frothers require much less time to froth milk versus a manual milk frother. They are similarly priced to manual milk frothers and they are capable of frothing both cold and hot milk. In comparison, electric milk frothers work like a charm, they easily whip milk at a high velocity. You simply pour the milk into the jug and turn the switch on – you will get a high-quality milk froth with little to no effort and time. Also, most electric milk frothers are built of stainless steel, therefore they’ll better stand the test of time. Breville – it’s one of the most prominent and trustworthy brand names in kitchen appliances. This BMF600XL is undoubtedly one of our top overall picks! Its truly a badass machine. This machine is made of a durable, stainless steel exterior and offers tons of great features that will help you create an amazing cup of joe. The Breville BMF600XL is built with professional precision and gleams on your kitchen counter with it’s stainless steel machinery. One of the key functionalities of this particular machine is its ability to create various levels of froth. With just the push of a single button, you can choose between hot or cold froth (Two Noms Up!). This milk frother has tons of great features that will give you smooth and silky tasting milk for your coffee or hot chocolate every time. 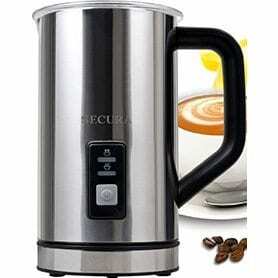 It comes with a stainless steel milk jug with inner measurements, has easy to use controls including a simple start/stop push-dial that you can use to control the temperature depending on the beverage you are creating. This bad boy only takes a few minutes to heat up so you can enjoy your coffee in almost no time at all. The Breville BMF600XL show-stopping machine perfect for your kitchen counter. With its extraordinary features and functionalities, it’s a no-brainer! This shiny milk frothing machine is one of the most affordable machines on our list. You can enjoy gourmet quality coffee without spending a fortune! 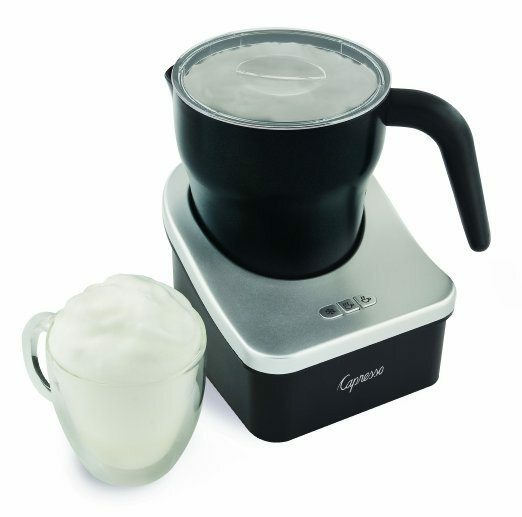 Whether you want a hot froth, a cold froth or maybe even some whipped cream, this Epica automatic milk frother can easily whip it up for you. It’s also a quiet machine, and with all it’s features and attributes, it’s designed to make your coffee experience a breeze. 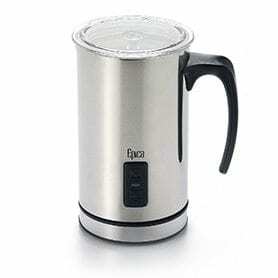 The top quality stainless steel material makes the Epica Automatic a sturdy and heavy-duty frothing tool. The vacuum insulation works hard at keeping your froth to it’s desired temperature: cold or hot. The carafe of this frother is completely detachable from the base and it’s very easy to pour. One of the common complaints we have about frothers is that many of them are difficult to pour from. Furthermore, the Epica Automatic has a pretty huge storage capacity compared to other frothers. With 3 settings, vacuum insulation, and a detachable carafe, this is a great milk frother that does almost everything a machine twice its price can do. The Epica is a no-nonsense coffee machine that does exactly what it’s meant to do, create some delectable milk froth! From foamed coffees to hot chocolate, you can appreciate a wide range of hot or icy beverages garnishes with the assistance of this jumbo milk frother. It's one of the most accessible commercial grade style milk frothers available on the market right now. 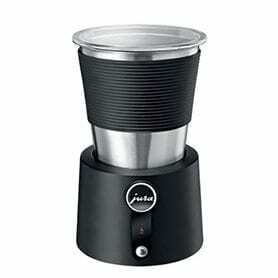 The Capresso Froth Tec has a pleasant stainless steel outline with a substantial liquid compartment. Three light-up working switches are situated on the base the frother for ultimate ease of use. There are also measuring lines on the glass jug and since it’s made out of glass, you can watch your milk as it froths. This big bad boy is a strong and competent machine! This machine can effortlessly create smooth, delicious, and longer lasting froth. For safety reasons, it has a dual automatic shutdown option. The Capresso Froth Tec also has one froth disk and one heating disk, which increases the number of drinks you can make with this machine. This is a very fast machine that can heat your milk in no time, and it is incredibly easy to use. Using this tool is very easy, even a child could operate it! Coffee milk to chocolate milk, it can handle every beverage job without problems. This is a magnetic powered appliance that can be used to make all your favorite drinks, it’s definitely a classy addition to any coffee lover’s kitchen. The first thing you’ll notice about the Secura Automatic Electric Milk Frother would be its size, it’s got twice the capacity of most of the milk frothers out on the market. The unique selling proposition of this particular model of milk frother is its ability to froth and heat a large amount of milk at a time. Another notable point would be the addition of free cleaning brush. This milk frother has a high-quality stainless steel exterior material with the thermal insulation to keeps the froth hot or cold on. This is a long lasting machine and you can easily detach the base from the pitcher. It has light-up buttons, which make it easy to use even in the dark, and a simple interface that won’t confuse even the most gadget-phobic among you. There are different maximum level marks for maximum milk froth level and minimum milk level. For cold frothing, you have to press and hold the power button for 3 seconds. Just press the power button once to turn on the power and heater at the same time for hot drinks. 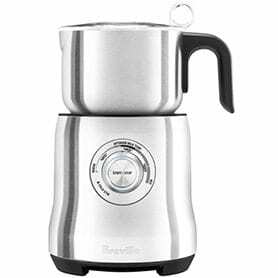 This deluxe automatic milk frother is one of the most productive, trusted and highly rated milk frothers of all time. 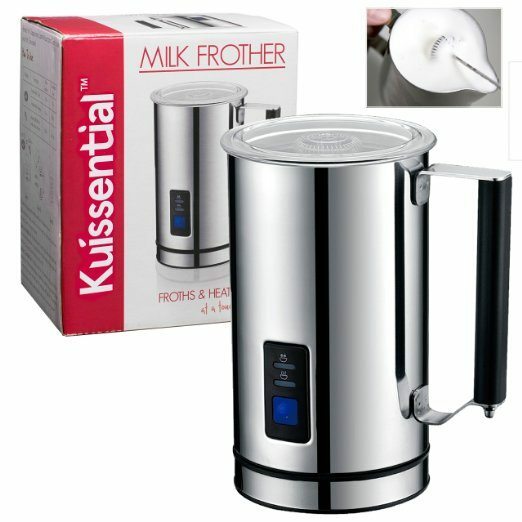 With its solid body and different options for quality-froth, the Kuissential Deluxe is truly a standout in a sea of milk frothers. This machine also has a see-through removable top, so you can watch the frothing happen live! It has an easy to see control system located on the pitcher and has a fully detachable base. The Kuissential looks shiny and professional, and will compliment any kitchen. Weighing just 2.5 pounds, this machine is light and small enough to store. The Kuissential Deluxe keeps it simple, it has got two basic functionalities – Hot and Cool. You can enjoy your cappuccinos, lattes, hot chocolates easily with this frother. The non-stick interior is another great addition to this particular model which comes in handy during cleaning time. Ideal for hot, cold and even almond milk, this is a non-stick machine that is easy to use and clean. With a sturdy exterior, nonstick interior, and detachable base, this Kuissential Deluxe is a striking frother with a mid-range price point. This stainless steel milk frother is one of the most highly ranked manually hand operated milk frothers available in the market. This type of milk frother is also known as a frother press and it can be heated directly on the stove. Despite its very low price, the HIC still comes with many desirable features. The elegant milk frother is exceptionally desirable for individuals who love manual milk frothing. It’s a durable product, which will add a touch of elegance to any kitchen. With the 14 ounces of capacity, it has a reasonable storage capability. This no-nonsense budget frother is dishwasher safe, so it is quick and easy to clean. The HIC is for the coffee snob, who appreciates the extra care and effort needed to create the perfect froth. It can be used to make cappuccinos, hot chocolates, lattes and more. The HIC has an ergonomic design and is easy to pour and operate. Just pump it about 15 times to get that delicious froth topping. Overall, it’s an outstanding alternative for those who prefer a manual milk frother. 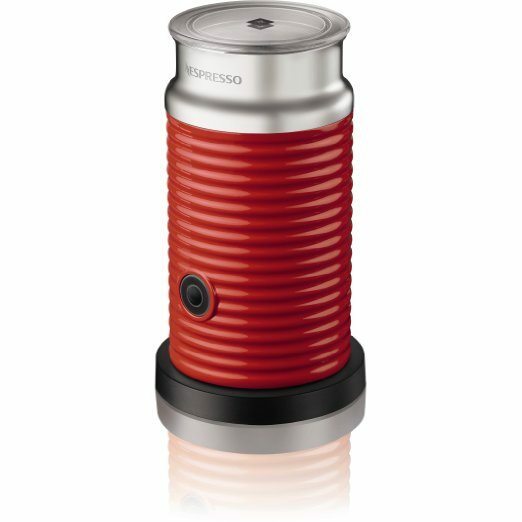 The Nespresso Aeroccino is available in silver, black and red. This fine-looking milk frother is built of several materials. The pitcher is fabricated from stainless steel with a plastic outer exterior. The design is not only stunning, but it’s also functional, it’s exterior grippy so that you can easily grab it with your hand. This machine comes in at just 2.2 pounds but it still packs a punch. The Nespresso offers all the usual features. It has a unique, one button technology, and is therefore very easy to use. You can create hot milk and froth with a one-second press of the button. Just press the button for two seconds for cold milk or froth. Due to its small size, the machine can easily fit into a handbag and be transported effortlessly. With its sleek design, automatic shutdown feature, very-easy-single-button-operation, and grippy exterior, the Nespresso Aeroccino is a dream gadget for coffee aficionados. This Swiss designed milk frother has most of the standard features of a mid-level machine. We are especially in love with its super stylish design. It’s easy to use, fast, and makes quality product, what more would you want!? The base is also made up of a solid material that looks and fits great with the pitcher. Unlike some other illuminated touchpad enabled milk frothers, it is a switch enabled machine. Great for making super hot, not lukewarm milk, this is a fully functional appliance that would look great on your kitchen table. The Jura Automatic is nonstick and we love how easy it is to hand clean. Similar to the conventional milk frothers; hot, warm and cool settings are also available on this machine. Moreover, it got dual auto shut-off functionality. It can froth 8 ounces of milk at a time or 12 ounces in the case of frothed milk. With it’s unique and stylish design, auto shut-down security, multi-purpose usability, and reasonably standard storage capacity, this particular milk frother from Jura is a marvelous choice for coffee enthusiasts at a higher price range.